The Inland is all about gorgeous sarees crafted from different weaves. With options for any occasion these are made from natural dyed hand-loomed khadi sarees to handwoven kantha cotton sarees, there's enough option to drape yourself 365 days. A saree is timeless, a must-have and when you have a brand that does handloom versions, you know you have struck gold. Say hello to The Inland, an Instagram-based brand that has a fabulous and extensive collection of handloom sarees crafted by artisans all over the country. We are talking about the ever-popular khadi sarees and the comfy cotton sarees that feature everything from natural dyes to intricate threadwork. Perfect to easily get weaves all the way from Bengal to South India, and from south to the other corners of India. 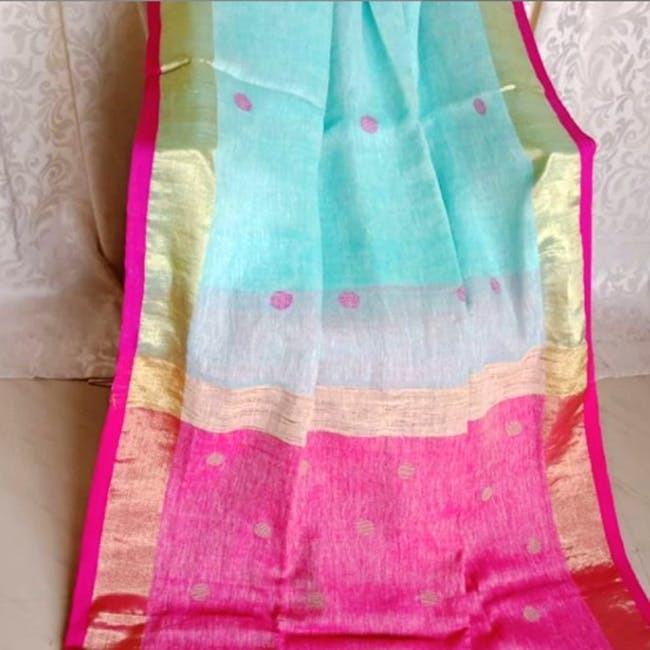 You've got colourful kantha cotton sarees from Bengal, the monochrome cotton sarees from Chettinad, and Jamdani sarees of Bangladesh with their intricate designs and weave work. If you look at the Instagram handle you will see all sort of designs featured there. For instance, the light and breezy collection of soft khadi cotton sarees in happy colours such as pink, blue, green, and yellow. There's also a whole range of dark and sombre shades like brown and grey that work for the office. In fact, the sarees work for all occasions mind you -- from an ethnic day at the office to just when you feel like wearing a saree and slaying it about -- and since they start at INR 1,500, it's easy on the pocket too. If you are not a fan of shopping for products via Instagram, then you might find that their lack of a website a bit difficult. But needless to say, you will find all their best sellers of their handle. They do shipping all over the country and are frequent at pop-ups and flea markets.